In solidarity with the declaration of Marikina City in state of calamity and the order of Marikina City Mayor Marcelino Teodoro to bring food and other relief items to the evacuation centers, Marist School donated canned goods, powdered milk, bottled drinking water, beverages, biscuits, cookies, snack items, used clothes, diapers, and toiletries to the evacuees. 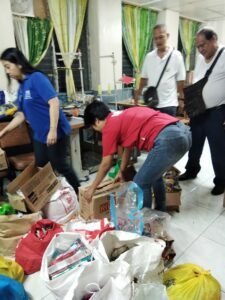 The donation of relief goods was coordinated with the Marikina City Disaster Risk Reduction and Management Office (MCDRRMO) and the Marikina City Social Welfare Development Office (MCSWDO), who distributed the goods to the evacuees. On Sunday, July 22, 2018, Marikina City Mayor Marcelino Teodoro, announced the declaration of Marikina in a state of calamity after continuous monsoon rains that caused flooding in low lying areas and prompted evacuation of more than one thousand families or about 5,000 individuals residing near the Marikina riverbanks. The MCDRRMO and the MCSWDO were mobilized for the relief operations. The relief goods were donated by students, parents and personnel of Marist School. In his transmittal letter, Br. Niño M. Pizarro, FMS, Marist School President, expressed his hope that the emergency response of Marist School and with continued prayers would help ease and relieve the evacuees from the emergency situation and provide for their subsistence while recovering and rehabilitating from the disaster. 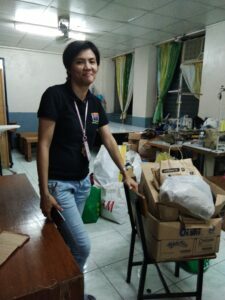 Emergency response to calls and orders for relief and assistance to victims of typhoons, volcano eruptions, flooding, earthquakes and other disasters is one of the community outreach services of the Marist School Community Extension Office under the Office of the School President. The community outreach services are venues where students, personnel and Marist mission partners get the opportunity to put into action the charism of St. Marcellin Champagnat to love and care for the least favored and to contribute to the achievement of Marist School mission to educate and form the young into good Christians and virtuous citizen. Photos show MCSWDO officers, social workers, aides, staff, drivers, and volunteers carrying and loading relief goods from Marist School.